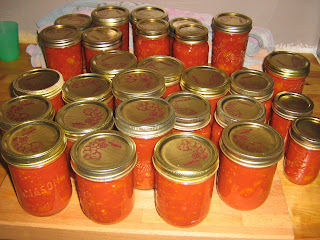 We always give preserves as gifts and so we (mostly I) spend quite a bit of time at this time of year canning things. 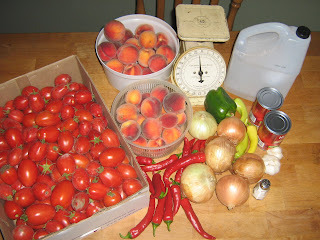 Today was the first batch of tomato peach salsa. These are the ingredients. 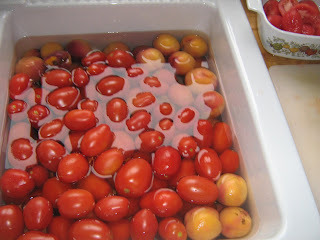 The tomatoes and peaches blanched and ready to have their skin removed. Add them and the remaining ingredients and cook for about an hour. That's it. It takes about as long as it takes to listen to The Very Best of the Drifters CD (twice!) and disc one - The Hits from the Johnny Cash the Legend Box set. (go on Samantha, you can listen to the songs if you click on the link.) Yes, I know...my music preferences were set in my formative years during long car rides with my parents listening to their music. I love oldies. I now take great pleasure in indoctrinating (sounds better than brainwashing, doesn't it?) my own boys with the same music on my long car trips with them. Recently I was skipping a few songs on a Gordon Lightfoot CD to get to Cotton Jenny and W stopped me at Old Dan's Records to say that he liked that song and wanted to listen to it. You see, it really does work, a five or six hour drive is plenty of time to turn them onto Elvis, John Denver, Merle Haggard. etc. Although for some reason I haven't been able to get them to warm to Anne Murray yet. Hmmm. Better plan another road trip. Wanna come Samantha? I promise I won't play any of my Elvis CDs. (do you believe me?) The original recipe is somewhat different than how I make it now. (right Katherine and Samantha?) It only called for 2 cloves of garlic. Two cloves? I don't even get the garlic jar out of the cupboard for 2 cloves. C'mon, two whole heads is more like...at least. I decided that I had enough ingredients to quintuple the recipe. (is that a word? sounds right) It is probably a good idea when one decides that they want to quintuple a recipe to take into account the size of one's biggest pot. 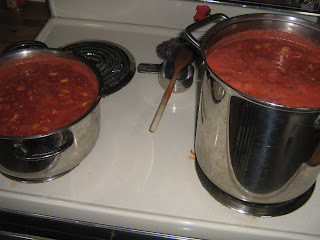 It all turned out fine when I decided to do two pots full and that way be able to make one spicier than the other. Here they are all canned. The bigger batch at the front is Hot!, the smaller batch at the back is Not! The salsa looks great, Heather. It's so rewarding to have home canned foods to enjoy throughout the year. You are like a factory, just cranking out all that canning!